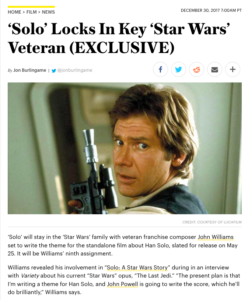 I interviewed composer John Williams recently and happened to ask him about the stand-alone Star Wars movie titled Solo (about the adventures of a pre-Episode IV Han Solo). He confirmed that he would be writing the theme for the film and that John Powell (who had already been announced as the film’s composer) would probably be incorporating it into his overall score for the film. Variety editors thought this scoop was too important to wait for our feature story, still several days away, so we broke the news early Saturday morning. It was repeated and linked-to so often, in so many other contexts around the world, that I’ve begun to wonder if it’s my most-read news story ever. Update: Williams recorded his Solo theme with a Los Angeles orchestra on Wednesday, Jan. 3, according to a musician’s social-media post that included photos from the Sony scoring stage. 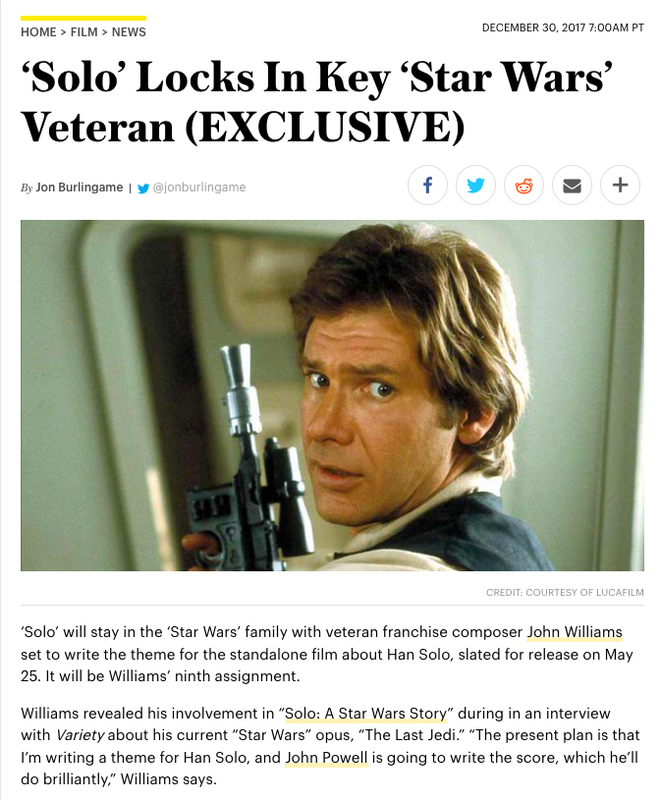 This entry was posted in Composers, Film Music, Interviews and tagged John Powell, John Williams, music for Star Wars movies, Solo: A Star Wars Story, Variety on December 30, 2017 by Jon Burlingame. 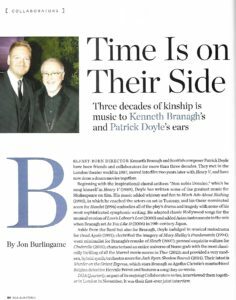 Composer Patrick Doyle and director Kenneth Branagh, who have Murder on the Orient Express in this year’s awards competition, had never done a joint interview despite 30 years of collaboration in the movies and on the stage (including memorable scores for Henry V, Hamlet, Cinderella and Thor). 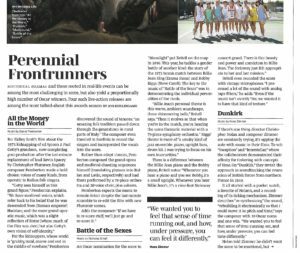 So when the DGA Quarterly — the magazine of the Directors Guild of America — asked me to quiz them about their long and productive time together, I was delighted. The piece is in the Winter 2018 issue, which is now online. 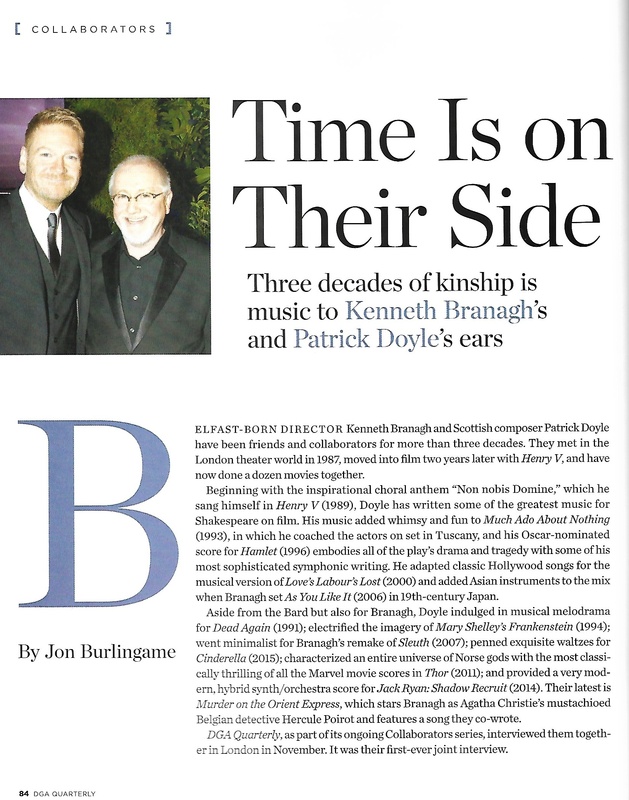 This entry was posted in Composers, Film Music, Interviews and tagged composer-director collaborations, DGA Quarterly, Kenneth Branagh, Murder on the Orient Express, Patrick Doyle on December 23, 2017 by Jon Burlingame. 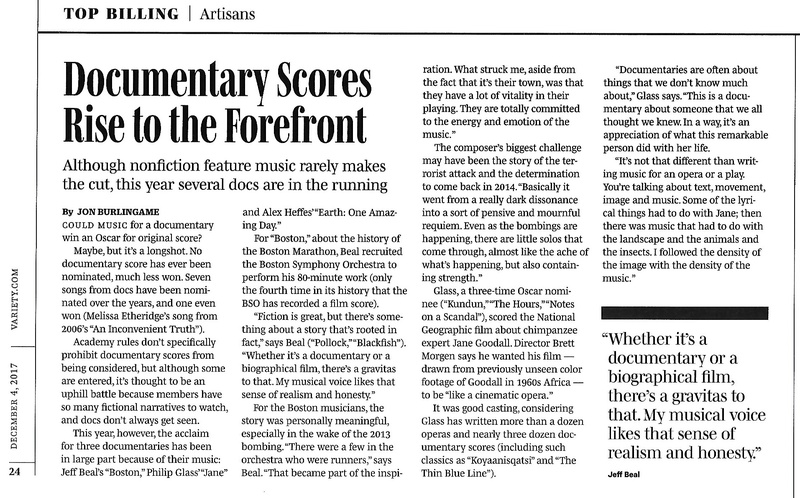 With the opening of The Post, Steven Spielberg’s new newspaper drama with its score by the legendary John Williams, I thought it might be a good time to look back at past movies with a newspaper setting and the music that accompanied them (and added a bit of information and commentary for each). So for this week’s online Variety, I found YouTube videos of music from Citizen Kane, Sweet Smell of Success, The Front Page, All the President’s Men, The Paper and Spotlight. 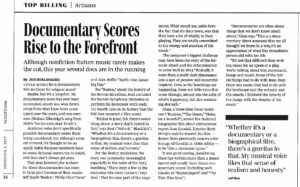 Comments from composers Elmer Bernstein, David Shire and Howard Shore are included. 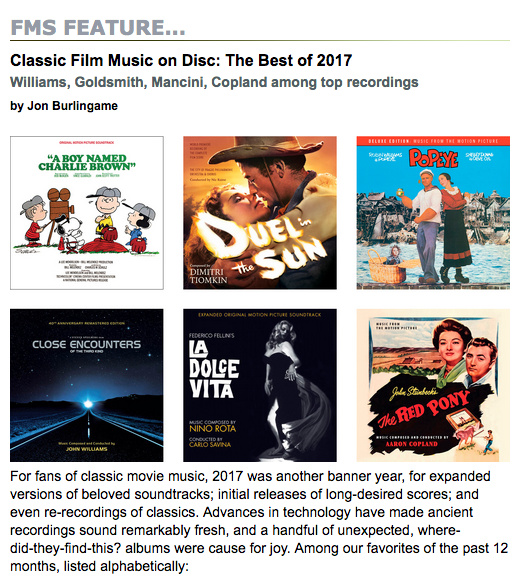 This entry was posted in Composers, Film Music, Interviews and tagged All the President's Men, Bernard Herrmann, Citizen Kane, David Shire, Elmer Bernstein, Howard Shore, John Williams, music for newspaper movies, Spotlight, Sweet Smell of Success, The Front Page, The Paper, The Post, Variety on December 23, 2017 by Jon Burlingame. 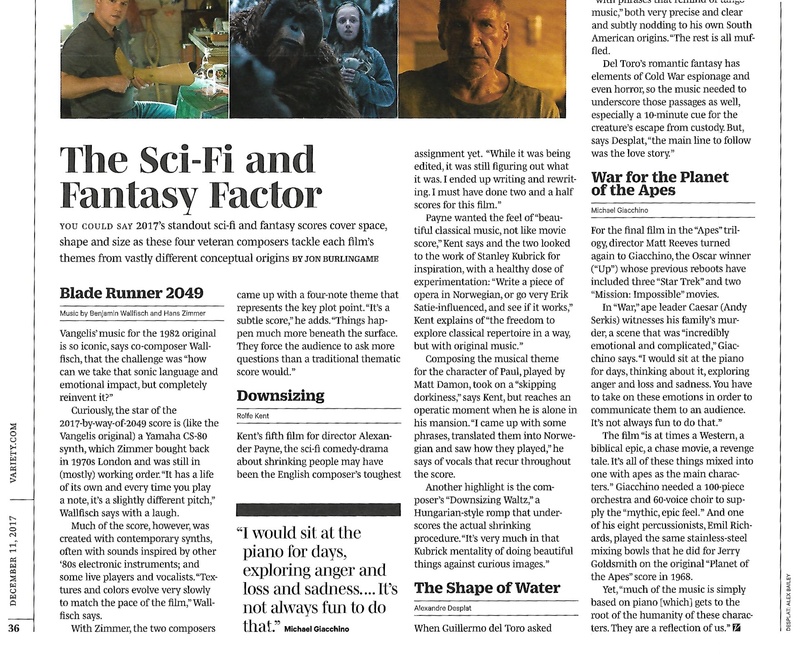 For another in Variety‘s series of looks at this year’s Oscar-worthy film music, I singled out four films that might be characterized as either fantasy or science-fiction: Alexandre Desplat’s The Shape of Water, Rolfe Kent’s Downsizing, Hans Zimmer and Benjamin Wallfisch’s Blade Runner 2049, and Michael Giacchino’s War for the Planet of the Apes. 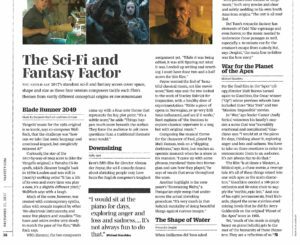 All four are terrific, and while Desplat’s Shape of Water seems to have the best chance at nomination, I wouldn’t count out any of them! 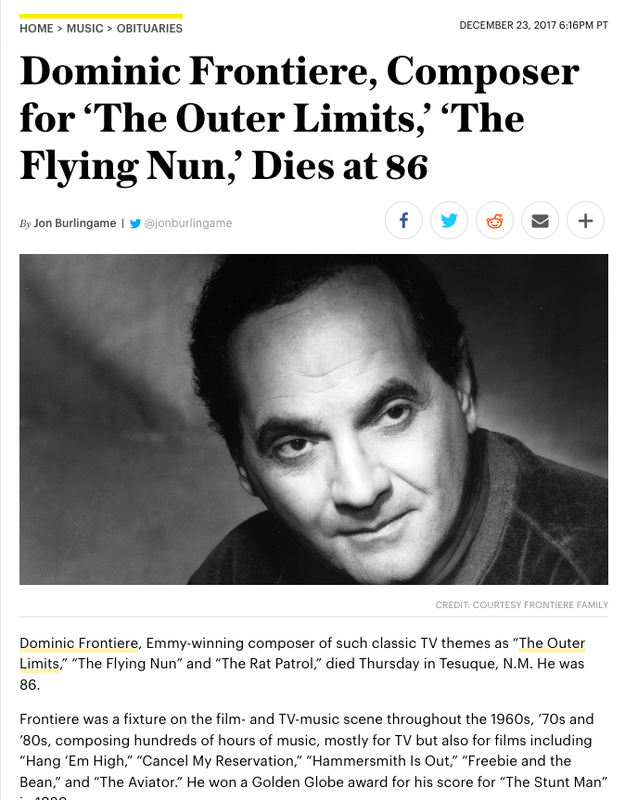 This entry was posted in Composers, Film Music, Interviews and tagged Alexandre Desplat, Benjamin Wallfisch, Blade Runner 2049, Downsizing, Hans Zimmer, Michael Giacchino, music for fantasy films, music for sci-fi, Oscar music, Rolfe Kent, The Shape of Water, Variety, War for the Planet of the Apes on December 11, 2017 by Jon Burlingame. 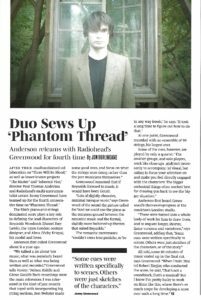 Radiohead’s Jonny Greenwood, who rarely grants interviews, made an exception to talk to Variety about his music for Paul Thomas Anderson’s new film Phantom Thread, starring Daniel Day-Lewis in what may be his final acting role. Greenwood was fascinating, talking at length about his mostly piano-and-strings score for the period piece about an enigmatic London couture figure and his model/lover. Of Greenwood’s four films for Anderson (including the remarkable There Will Be Blood), this score stands the best chance to get the composer his first Oscar nomination. 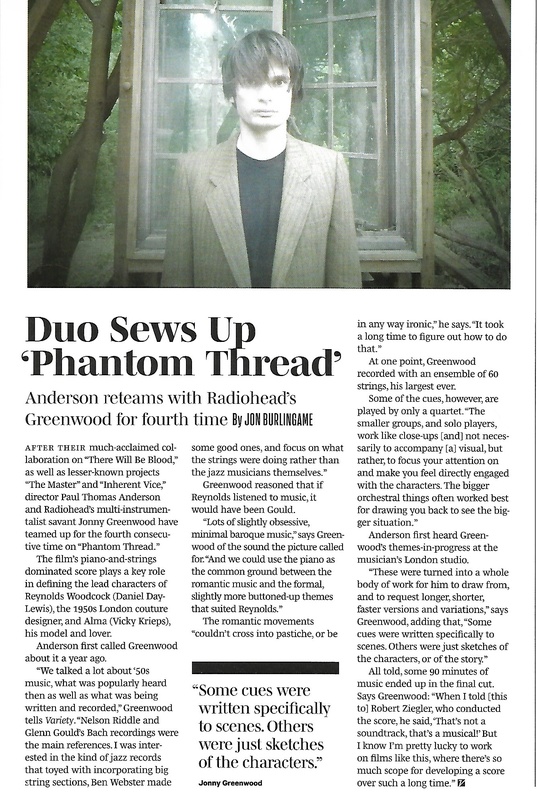 This entry was posted in Composers, Film Music, Interviews and tagged Jonny Greenwood, Paul Thomas Anderson, Phantom Thread, Variety on December 11, 2017 by Jon Burlingame. 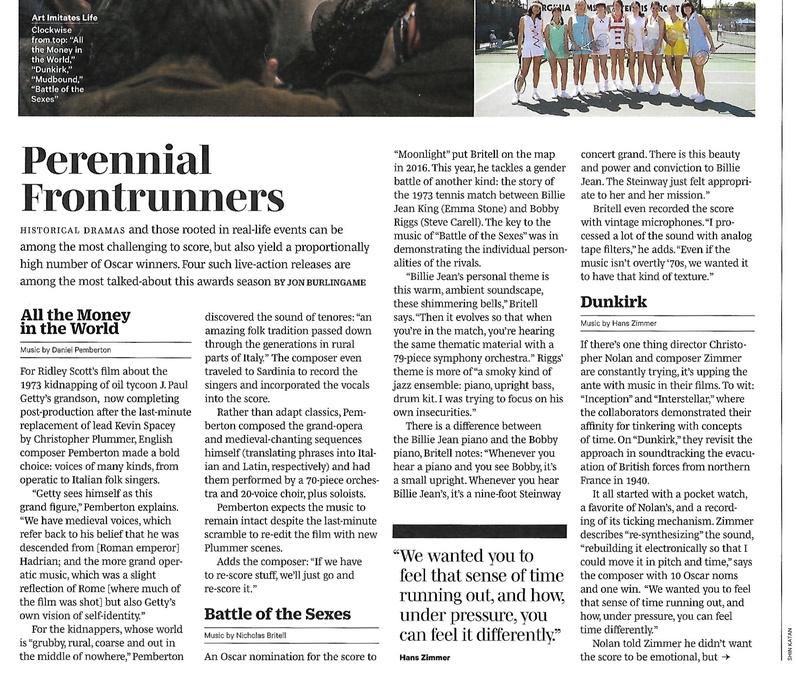 Variety editors asked me to take an early look at the original-score race at the Oscars, even though it was only November and there are still a number of films yet to be screened. Realistically, at this point there are about 25 legitimate contenders for the five available nomination slots, but at this early stage I think it’s best to present them without making predictions (which is always dicey anyway). 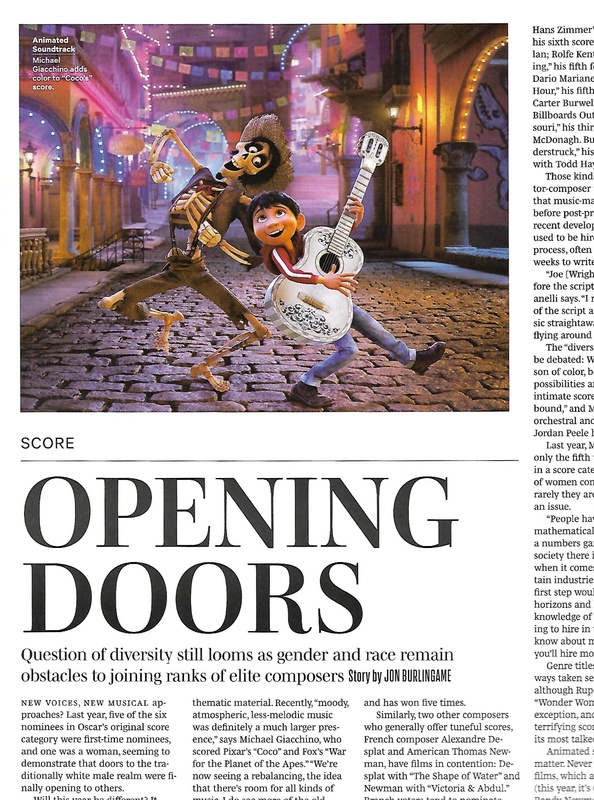 Along the way I found room to talk about diversity and gender issues, which are likely to be a factor in the race; and what composers are talking about in terms of time and freedom to write the music that will best enhance their films. 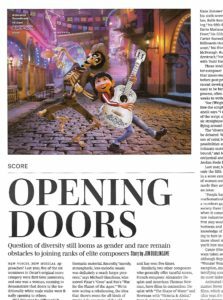 Composers quoted include Michael Giacchino (Coco), Dario Marianelli (Darkest Hour) and Tamar-kali (Mudbound). 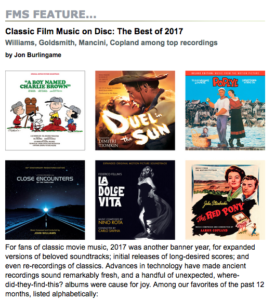 This entry was posted in Composers, Film Music, Interviews and tagged Coco, Dario Marianelli, Darkest Hour, Michael Giacchino, Mudbound, original score Oscar, Oscar music, Tamar-kali, Variety on December 1, 2017 by Jon Burlingame.